Rotherham United thought they were getting their first away win of the season when they went ahead with just fifteen minutes to go this afternoon at Ewood Park but it wasn’t to be with Bradley Dack rescuing a point for Blackburn in the last ten minutes. The ground fell silent for a minute to remember the fallen in the wars ended by The Last Post played on the trumpet. The Millers got off to a good start with Ryan Williams taking the opportunity to pinch the ball with after some sloppy Blackburn play sending Michael Smith off into the box but Rovers’ ‘keeper David Raya was a step ahead of him and collected. At the other end Rovers had two corners which skipper Richard Wood dealt with before some nice work between Joe’s Newell and Mattock saw the ball headed to safety by former Miller Richie Smallwood. With Will Vaulks suspended Zak Vyner took over long-throw duties finding first Clark Robertson then Newell both having no luck. A superb cross in from Williams saw Raya take it at the second time of asking before Smith sent a ball in for Newell but his header was easily saved. A fine save from Rotherham ‘keeper Marek Rodak from Danny Graham didn’t really matter as the flag was up for offside before the Millers went down the other end with Richie Towell whose volley from the edge of the box ended up on the roof of the net. Rodak made a good save from Amari’l Bell before some good work from Vyner saw him get the ball before Adam Armstrong had time to set up a shot. With twenty-five minutes gone the Millers might have gone in front when a Newell corner found the head of Smith who sent it to Mattock but the left-back saw his header go just over. Minutes later Armstrong looks to be on his way but Vyner got the better of him with the ball going for a corner which Smith, Newell and Mattock did well to get away. A minute later Armstrong finally got the better of Vyner only to see his shot hit the underside of the crossbar and go to safety. Twice the Millers kept Rovers at bay with first Robertson then the rest of the defence keeping shots out. In the final minute of the half an Elliott Bennett cross was well saved by Rodak at the back post. Rovers started the second half with Ryan Nyambe on for Harrison Reed. After some good work from Adam Armstrong and Bradley Dack, Danny Graham brought off a good save from Marek Rodak before the Millers’ ‘keeper was in action again when Elliott Bennett tried his luck from distance. At the other end Darragh Lenihan had to be on his toes to keep an effort from Michael Smith out before Richard Wood did well to head off the line from Graham. Rodak then did well to get down to a shot from Lenihan. On the hour mark the Millers first change saw Jon Taylor replace Joe Newell and only a good challenge from Lenihan stopped the Millers sub before he got the ball into the box. Rodak made an excellent save from Dack before Clark Robertson did well to block a cross-come-shot from Kasey Palmer followed by Joe Mattock clearing off the line from Adam Armstrong – it was certainly backs-to-the-wall for the Rotherham side. Ben Wiles came on for the Millers for Zak Vyner. Blackburn came close to opening the scoring on the seventy-first minute when a Bennett cross found Graham at the back post but he glanced his header inches wide. 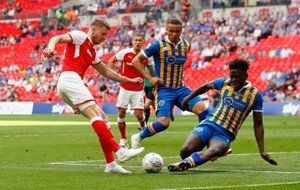 Minutes later the Millers took the lead after some good football from Ryan Williams saw him get the better of Amari’l Bell sending a cross into the box where Smith rose the highest and sent the ball into the corner of the net sending the six hundred and eighty travelling Millers barmy. And it could have been two a minute later when Taylor flew down the wing sending the ball to Smith who laid it back to Taylor but his touch was too heavy and the Rovers defence got it away. Joe Rothwell and Ben Brereton replaced Danny Graham and Richie Smallwood for the hosts. Smith, who had been pulled all over the place (again) all afternoon, was the first to get a yellow card for either a foul on Lenihan or for what he said afterwards. A fierce strike from Armstrong saw Rodak get the ball away but only as far as Nyambe whose shot was saved on the line by Wood. But with nine minutes to go all Blackburn’s pressure paid off when a low cross from Brereton found Dack who tapped the ball into the empty net to make it one-all. Williams had a shot deflected at the other end before a Palmer shot from distance went wide of Marek’s goal. As the board went up for five extra minutes Williams was replaced by Kyle Vassell. Richie Towell had a chance but blazed over before a goalmouth scramble at the other end saw Armstrong but a shot wide. Another point earned for the Millers on their travels this afternoon who had the better of the first half and battled well to make sure they left Lancashire with something.